Most of my day revolved around showing property and follow up work on the computer. In between shutting down the lap top and dinner, I had a burst of energy and creativity, and added a bit more fall décor to my home. Redoing the chippy entry table was quick and fun and satisfied my urge to create. 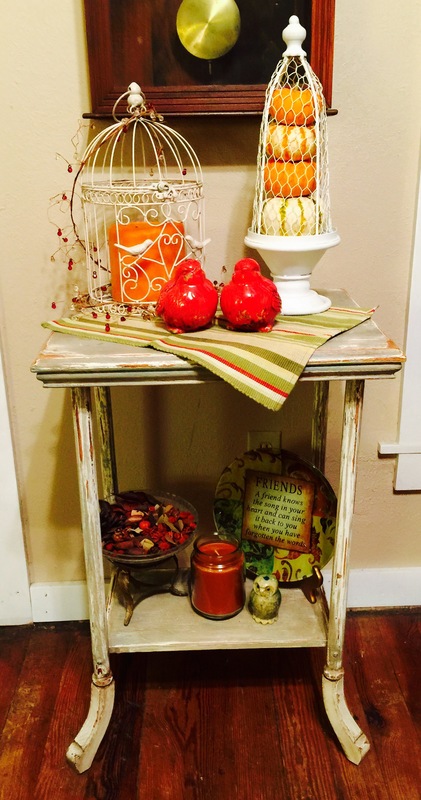 1) Other than the purchased gourds, I created this table vignette using items I already had on hand. It’s great fun, for me, and expands my creativity, when I pull pieces that I own together in new ways. All my decor gets reused and combined in endless ways. 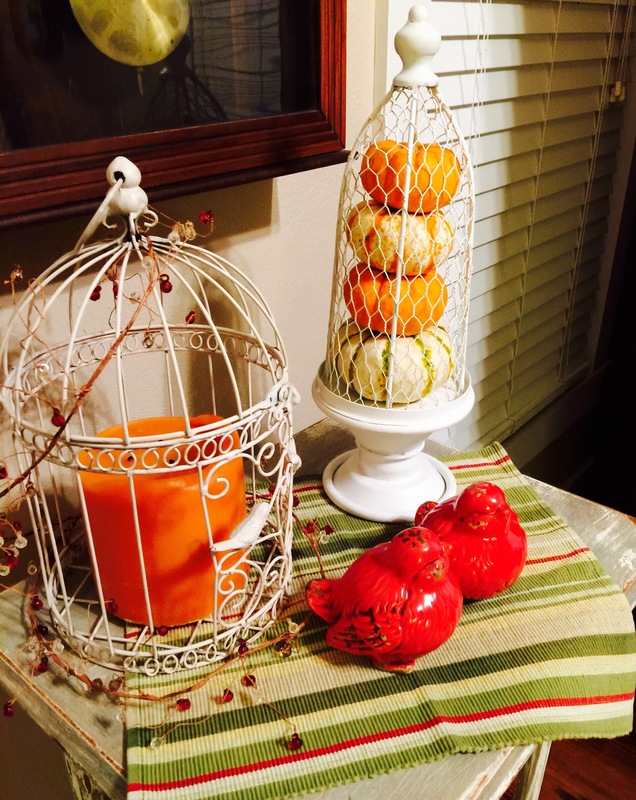 2) The stack of mini pumpkin-like gourds in the metal cloche was a happy accident. 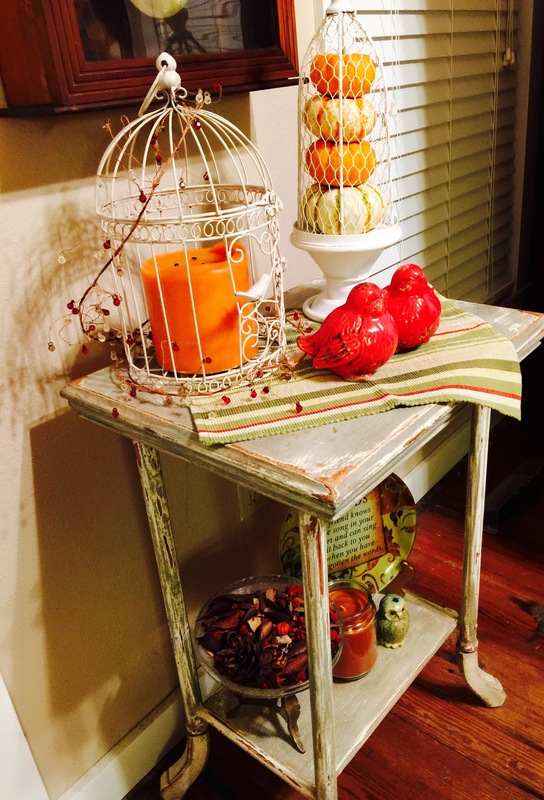 When I created the vignette in the vintage wooden sieve, I had one white gourd left over. I popped it into the cloche, so it had a temporary home. A few days later, I stood studying that cloche and visualized a stack of orange and white gourds, rising in decreasing sizes within the wire cover. Would that work? Only one way to find out. I purchased more mini pumpkins, paying attention to the sizes of the gourds. My idea came together perfectly and became the focal point of the table top. 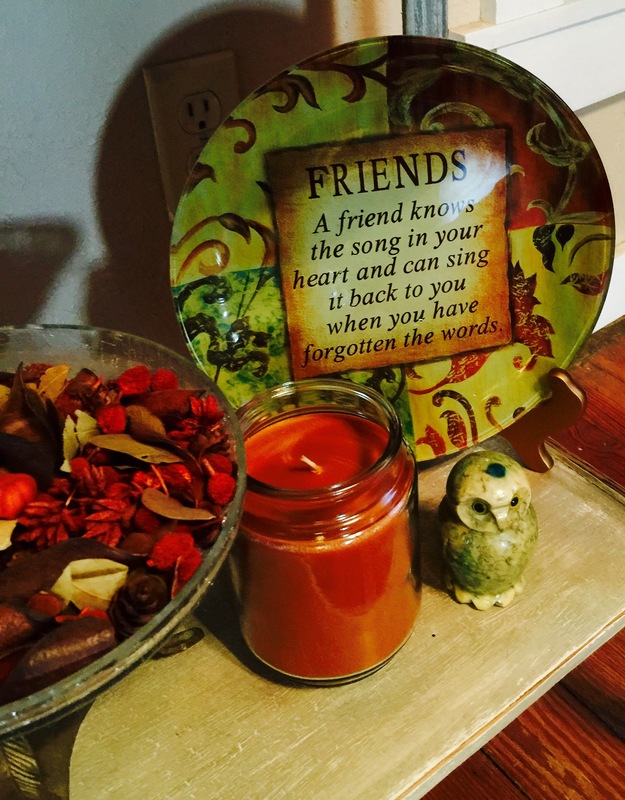 3) On the bottom shelf is a favorite quote on a plate with autumnal colors. “A friends knows the song in your heart and can sing it back to you when you have forgotten the words.” I cherish my friendships. How amazing it is to share the journey with those who know my heart so well. And nestled there in the front, is a little marble owl from Italy. That treasure came to me from my Aunt Annie, who passed earlier this year. He seems right at home as part of my vignette. I enjoyed listening to Liz Gilbert speak Monday evening, on creative living. I’m reading her book on the subject, Big Magic. One of the things she shared was that it’s important for creativity to be able to trust us. She explained that creativity is set free in us by being creative, every day, in big or small ways, wonderfully or imperfectly, for a few minutes or for hours. By expressing our creativity, consistently, joyfully, doing what we love to do, we send out the message that creativity is fostered by us, appreciated, honored. I so agree. As with so many things, the more we express and explore creativity, the more creativity flows to us. I love spending even a few minutes allowing my soul to hum with that vibrancy that being creative brings. And those days when I can spend hours in the creative process, then my soul opens wide and energy flows, and anything is possible.